Seeking to get out of a weekend rut and need entertainment for you, the kids, and even the pet dog? My tip? Put a medieval fair on your calendar. I just got back from the Abbey Medieval Festival, where I was put in the stocks, got up close and personal with a gypsy horse, ate medieval food and was a jousting tournament spectator! Upon our arrival, we could only marvel at the sheer size of the fair – this wasn’t some dinky community hall gathering; it was a celebration! 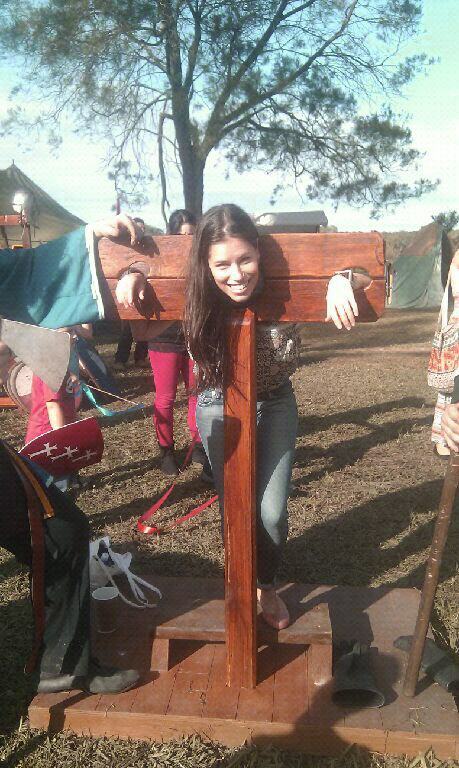 I was put in the stocks! Sprawling in every direction and punctuated by cries of ‘Huzzah!’, the Abbey Medieval Festival spanned all eras of the Middle Ages. There was a Byzantine area with real artefacts, a Gypsy camp to get your fortune read for 2 gold coins ($2), mead and mulled wine at the Stag Inn, workshops and demonstrations on every aspect of medieval life imaginable, and historical re-enactments. We watched a seige re-inactment in the Castle Arena, Turkish Oil Wrestling in the Oil Wrestling Pit (no, the wrestlers did not look even a little like Hugh Jackman), giggled at the Morris Dancing Workshop in the Village Green, popped by Fencing for Beginners, were surprised by real cannonball fire at the Finale (much louder than it sounds in the movies!) 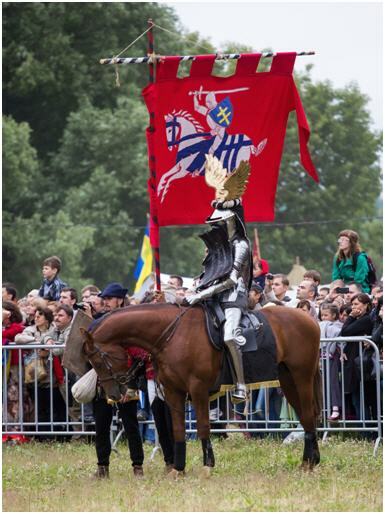 and, of course, were avid spectators at the Jousting Tournament featuring world champion jousters. That’s right: there is, indeed, a world ranking for jousters. The highlight would have been the stocks. Specifically, I was placed in the stocks near the Dark Ages and Viking encampment and auctioned off by a costumed knight as a suitable wife for cooking and cleaning the house. A bid was received – a total of one hardy goat. Luckily, I was soon released and soothed my pride by sampling medieval wares at the market. At Stagg Inn, we purchased a platter of mixed meat, where I certainly got my wish – the venison was tough as leather and exactly what I imagined when I thought of village medieval feasts. The medieval honey and elderflower cordial was absolutely delicous and fit, dare I say, for a king. 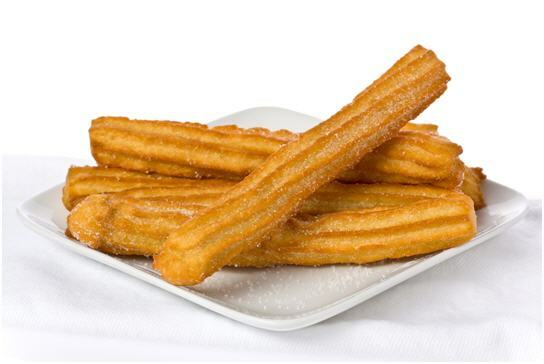 We sipped on the cordial and watched churros be made before our eyes – surprisingly, these Spanish treats were a medieval dessert. Who knew? Sadly, the Abbey Medieval Festival is over for another year, but I did promise to return in 2014. What I liked about this quirky event was that it was just so different from how I usually spend weekends. It’s like a dam has been broken – I’m now scanning the community papers for nearby events and have since experimented with desserts at a Greek Festival and and pencilled in other local activities and theatre into my calendar. Who’s stuck in a rut this winter? Definitely not me! 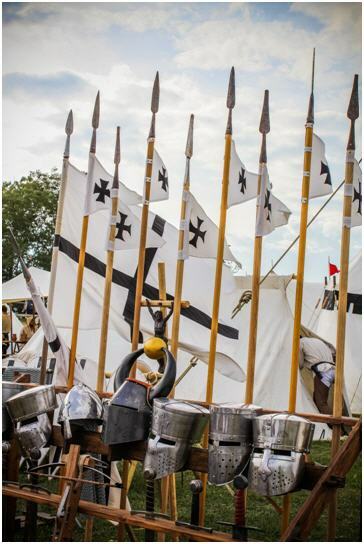 Have you attended a medieval fair before? Have any suggestions for eccentric weekend activities? Share your tips with fellow travellers in a comment below!